2) Endanger their water supply and air quality. 3) Worries about increased commercial use on the 135-acre site. Dominion said the compressor station is needed to pump natural gas from Pennsylvania to Virginia. The natural gas will be used by electrical power stations to meet the growing need of customers in the region. Representative Roscoe Bartlett has asked federal regulators to review the project site. Compressor stations help keep natural gas moving through underground pipelines. The Federal Energy Regulatory Commission (FERC) also request the company to consider an alternative location. Based on the original proposal, construction would not start until 2012, with completion by 2014. 4) Ratifies an agreement with Constellation Energy Group that provides $170, one-time rebates to residential customers of Baltimore Gas & Electric Company. Carbon credit auction proceeds, for example, will go to energy efficiency and conservation programs meant to lower electricity usage and bills. There will be an increase in grants for solar energy and geothermal heat pump systems for homes. The new laws aim to reduce the state's energy consumption 15 percent by 2015 and to double the amount of renewable energy that power companies must provide for sale to customers to 20 percent by 2022. The Constellation settlement is valued at $2 billion and ends a legal battle with the state. In addition to the credits, consumers would no longer be obligated to pay $1.5 billion in future costs for dismantling nuclear power plants in Southern Maryland, as had been stipulated as part of the state's 1999 deregulation plan. The settlement also gives the state some assurance that the company will build a nuclear power plant here. In exchange, the company avoids regulatory inquiries into certain costs consumers paid as part of the state's move to a deregulated energy industry. Update: President Bush signed the bill into law on May 21, 2008. 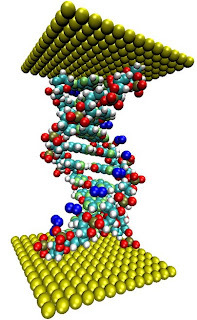 The Senate voted 95-0 to approve the Genetic Information Nondiscrimination Act (H.R. 493), which prohibits discrimination on the basis of genetic information with respect to health insurance and employment. The legislation now goes back to the House, which passed in the House of Representatives on April 25, 2007 by a roll call vote of 420 Ayes, 3 Nays, 9 Present/Not Voting. President Bush supports the legislation. AAEA supported the legislation. Title I - Genetic Nondiscrimination in Health Insurance: (Excerpt) Prohibits a group health plan from requesting or requiring an individual or family member of an individual from undergoing a genetic test. Provides that such prohibition does not: (1) limit the authority of a health care professional to request an individual to undergo a genetic test; or (2) preclude a group health plan from obtaining or using the results of a genetic test in making a determination regarding payment. 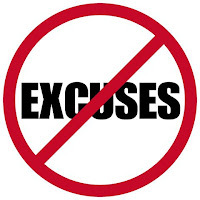 Requires the plan to request only the minimum amount of information necessary to accomplish the intended purpose. Title II - Prohibiting Employment Discrimination on the Basis of Genetic Information: (Excerpt) Prohibits, as an unlawful employment practice, an employer, employment agency, labor organization, or joint labor-management committee from discriminating against an employee, individual, or member because of genetic information. Prohibits, as an unlawful employment practice, an employer, employment agency, labor organization, or joint labor-management committee from limiting, segregating, or classifying employees, individuals, or members because of genetic information in any way that would deprive or tend to deprive such individuals of employment opportunities or otherwise adversely affect their status as employees. Mr. Turner, right, is apologizing to the religious for insulting religion most of his life, but partnering with churches to fight malaria. We applaud his interest but disagree with his method. Mr. Turner has chosen the politically correct route of bed nets instead of the effective route of utilizing DDT. Using heavy outdoor spraying of DDT would eliminate the mosquitos that carry the malaria parasite and after the pest is eliminated, stop the spraying. That is the way we eliminated malaria in the United States and is a very good model for eliminating malaria in the region where is is needlessly killing the most people: Africa. The disease kills more than 1 million people a year — mostly women and children under the age of 5 in Sub-Saharan Africa Traditional environmental groups are more concerned about the health of birds than the lives of African children and have used their multibillion-dollar international might to crush the effective use of DDT to permanently solve this problem. All bird populations threatened by the use of DDT in America recovered after its use stopped. 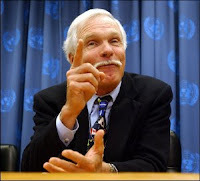 Turner's United Nations Foundation, which he started in 1997 with a $1 billion donation, launched a $200 million anti-malaria project with the Evangelical Lutheran Church in America, the Lutheran Church-Missouri Synod and the United Methodist Church. The Bill & Melinda Gates Foundation also provided a $10 million grant that will help promote the campaign in churches. Turner's foundation is working with the Nothing But Nets campaign, which provides insecticide-treated bed nets in needy communities. Instead of wasting hundreds of millions of dollars on ineffective bed nets, several million dollars worth of DDT should be utilized to solve this problem. AAEA would be happy to make these arrangements. African American Environmentalist Association (AAEA) President Norris McDonald, left, appeared on National Public Radio (NPR) on the 39th Earth Day (April 22) and discussed environmental and environmental justice issues. During the program he discussed the upcoming State of Environmental Justice in America Conference 2008 and many other issues. Click on the link above to listen to the interview. "The environmental movement has become increasingly mainstream, but on this 38th anniversary of Earth Day, we take a look at how it affects African Americans. For people struggling to survive a tough economy, do they have time to care about being "green"? We get insight from Monique Harden, co-director of Advocates for Environmental Human Rights, and Norris McDonald, president of the African American Environmentalist Association." The Rosebud Sioux turbine paved the way for the Fort Berthold Reservation in North Dakota to commission a 65-kilowatt turbine in 2005. 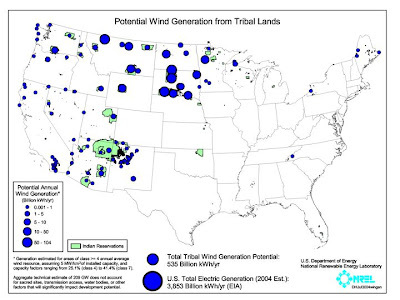 Tribal lands are rich in wind and it is estimated that the wind energy potential from reservations in the northern Great Plains is enough to power about 50 million homes annually. Tribal leaders are looking to wind-powered electricity generation to forge a renewable energy economy. Since 1995, a coalition of Great Plains tribes known as the Intertribal Council On Utility Policy (COUP) has worked to generate jobs and new revenue streams through tribal-owned wind energy projects. These utility-scale turbines are arrayed along federal transmission lines that carry hydroelectric power from the mainstem Missouri River dams. This will allow the tribes to sell surplus power to the Western Area Power Administration (WAPA), markets and transmits electricity from federal hydroelectric power plants. Persistent droughts throughout the West have reduced federal hydropower production nearly 50 percent, so WAPA has filled the shortfall with lignite coal-fired electricity - significantly increasing emissions near tribal lands. Nationally, reservation households are 10 times less likely to be electrified than other U.S. households. Small wind and solar projects are expensive, especially for tribal communities, where unemployment may be 50 percent. In large-scale projects, however, the tribes have the opportunity to invest in renewable energy-based economies. The Rosebud Sioux tribe of south-central South Dakota initiated the phased wind-development plan. Dedicated in 2003, Rosebud's initial utility-scale, 750-kilowatt (kW) turbine, "Little Soldier," is installed at the Rosebud Hotel and Casino, the tribe's largest commercial development center. In 1999, Rosebud became the first tribe to receive a grant - covering half the turbine's cost, about $500,000 - under the U.S. Department of Energy's Tribal Renewable Energy Grants. The tribe secured a loan from the U.S. Department of Agriculture's Rural Utilities Service to finance the balance. The tribe decided to sell the bulk of the turbine's output as bundled "green power" to a local Air Force Base on a short-term contract. That established the precedent for tribes to be green power vendors to the U.S. government. The tribe sold off the remaining generation and environmental attributes of the turbine's output into separate markets, as "energy" to the local utility and as carbon offsets to marketer NativeEnergy, of which COUP has a majority equity stake on behalf of its member tribes. The 195-foot turbine produces 2.4 million kilowatt-hours per year - keeping 25 million tons of lignite coal in the ground over its lifetime. The second phase of the Rosebud project is the 30-megawatt St. Francis wind farm, scheduled for construction this year. Together, the Rosebud turbines will comprise the nation's first large-scale Native American-owned and -operated wind farm. 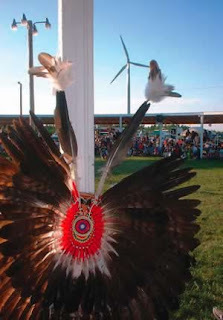 Integrating tribal wind with the grid, The Rosebud tribe's wind project was a landmark for tribal wind development, overcoming legal and business barriers that had discouraged utility-scale renewable energy development interconnected to the integrated regional grid system of federal and private operators. It paved the way for other Intertribal COUP tribes to install utility-scale turbines. These include 65-kW turbines commissioned on the Fort Berthold Reservation in North Dakota in 2005 and at the KILI Radio Station on South Dakota's Pine Ridge Reservation in May, along with the multimegawatt project planned at Rosebud. These turbine installations are but the first stage of the Intertribal COUP's wind-development plan. The Council vision is to tap the immense wind power potential on tribal lands, integrating two-dozen projects in six states with the federal hydroelectric generation and transmission grid. Tens of thousands of tribal members on 20 reservations would benefit directly from new, sustainable jobs and from the power and health benefits of local clean energy. The initial goal is for eight to 12 distributed projects totaling several hundred megawatts. Are Electric Utility Issues Too Complex For You? More than 1 million residents of the Washington-Baltimore area paid $920 million to take the Calvert Cliffs nuclear plant -- now owned by shareholders of Constellation Energy Group -- off-line in 2034 before state lawmakers agreed to a deal this month requiring the company to take over the federally mandated decommissioning costs. Do you understand it? We bet you probably just locked onto that almost $1 billion. Well let's dissect the article because it was very illuminating. Although utility issues were complex before deregulation, they have become down right Rubic's Cube since then. Now electric utilities are about to be reregulated. Deregulation was supposed to stimulate competition and led to reduced prices, but it was botched by politicians trying to deregulate the industry while artificially trying to protect ratepayers from price increases. The result was deregulating at the wholesale level but not at the retail consumer level and now those chickens are coming home to roost. Utility companies used to own the generation plants and the wires that deliver power to homes and businesses. 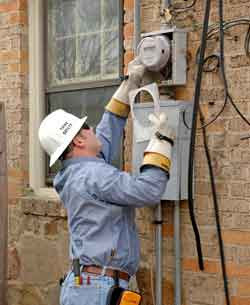 In the deregulated system, outside buyers or unregulated affiliates of the utilities took the plants over. Power companies said competition would cost them customers and the steady stream of revenue needed to recover their investments in plants. In response, lawmakers and utility regulators allowed power companies to charge ratepayers for those "stranded costs." In Maryland, Constellation, the parent of BGE, billed customers $975 million from 2000 to 2006, even though BGE had merely transferred its 11 plants to Constellation. So BGE basically paid itself for plants it already owned with customer money as though they were selling the plants to someone else? There are some brilliant people over there in Baltimore. A similar situation happened in Virginia where Dominion customers, including 700,000 in the Washington suburbs have paid $1.5 billion since 1998. Of course the utilities say they are paying billions on plant improvements, including expensive scrubbers to meet new environmental mandates. PEPCO actually sold its plants to Mirant, which ultimately filed for bankruptcy protection. Wholesale electricity prices are auctioned in agreements for years, months, the next day, the same day and by the hour. Before deregulation prices were based on what it cost a coal, nuclear or natural gas plant to produce electricity. After deregulation, the price was set by the last, most expensive plant that is needed to supply power, which right now is expensive natural gas. Unfortunately congestion in natural gas pipelines and electricity pipelines are significantly increasing that price. Not in my backyard (NIMBY) activists are also successfully preventing new pipelines and transmission lines from being constructed and so the problem will get worse. "Some courts are taking laws written more than 30 years ago to primarily address local and regional environmental effects, and applying them to global climate change. The Clean Air Act, the Endangered Species Act, and the National Environmental Policy Act were never meant to regulate global climate change. For example, under a Supreme Court decision last year, the Clean Air Act could be applied to regulate greenhouse gas emissions from vehicles...Decisions with such far-reaching impact should not be left to unelected regulators and judges. Such decisions should be debated openly and made by the elected representatives of the people they affect." First, the incentive should be carbon-weighted to make lower emission power sources less expensive relative to higher emissions sources, and it should take into account our Nation’s energy security needs. The wrong way is to unilaterally impose regulatory costs that put American businesses at a disadvantage with their competitors abroad which would simply drive American jobs overseas and increase emissions there. The right way is to ensure that all major economies are bound to take action and to work cooperatively with our partners for a fair and effective international climate agreement. Pacific Gas and Electric Company (PG&E) is retrofitting homes with Advanced Metering Infrastructure (AMI) Technology at a cost of US$1.7 billion. By the end of 2011, it will replace old meters with approximately 10.3 million new meters at nearly 6 million homes and businesses across PG&E's 70,000-sq mile service area. It also will deploy a communications network and back-end IT systems capable of collecting and processing hourly electric and daily gas usage data. The SmartMeter program will enable PG&E to provide its customers with demand-response rate options to reduce peak energy use by encouraging customers to shift demand to off-peak periods. Because electricity purchased in peak periods is more expensive, this load shift will reduce power procurement costs. It also will provide a variety of improvements in customer service, such as more accurate billing, and will eliminate the need for customers to unlock their gates and tie up their dogs on days meter readers are scheduled to visit. The state of California will benefit from additional levers to influence energy demand and from reduced environmental impacts. Lower peak demand reduces the need either to use older, less-efficient (and dirtier) power plants or to build additional generation facilities. This will help reduce the environmental impact of providing California consumers electric service — a clear benefit to the state. The utility will benefit from reduced operational costs and greater efficiencies. In fact these savings will cover roughly 90% of the cost to deploy and operate the system over its 20-year life. More than half of these savings result from the elimination of manual meter-reading activities. Other primary areas for operational savings include billing, remote connect disconnect, metering operations and outage restoration. The SmartMeter program will pay for itself over the projected life of the system; benefits will exceed costs. 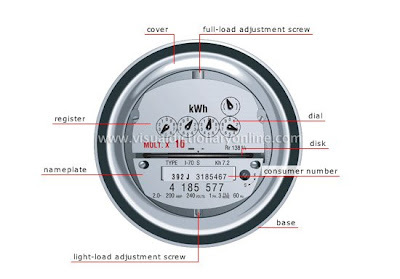 SmartMeter technology with solid-state meters would also facilitate communications with the programmable communicating thermostat technology being promoted and codified by the California Energy Commission through California's Title 24 building code. The Maryland State Highway Administration (SHA) comprehensive Disadvantaged Business Enterprises (DBE) program provides a variety of services to approximately 1,500 businesses, both prime and subcontractors, in the areas of outreach, business assistance, contract compliance, and on-the-job training. The Intercounty Connector (ICC) project will require a broad variety of DBEs with capacity in many design services and construction trades within the Washington and Baltimore metropolitan regions. The ICC Project Team has developed an aggressive DBE outreach, business assistance, and contract compliance program in order to identify and successfully engage as many DBEs as possible in the design and trade areas needed for the project. advance notification about outreach events, such as contract-specific Informational Meetings, procurement fairs, and conferences designed to build capacity and to enhance the availability of information about the ICC project. The ICC Project Team's primary point of contact for Civil Rights and DBE information is Marvin Eason, ICC Civil Rights Manager, Maryland State Highway Administration (SHA). If you have questions or concerns, or would like to have additional information, contact Marvin Eason at MEason@iccproject.com, or by telephone at 301.586.9286. For further information about the ICC DBE program, please refer to the DBE-oriented brochure entitled: The ICC Starts Here: Your Road to Opportunity. o - $4 billion in grants for communities with the highest foreclosure rates to buy and rehabilitate foreclosed properties. o - $100 million for pre-foreclosure counseling and stronger loan disclosure requirements. o - $7,000 tax credit for the purchase of foreclosed homes. o - modernization of the Federal Housing Administration that would enable more homeowners to refinance into loans backed by the Depression-era agency. A House bill steers tax breaks toward first-time home-buyers and investors in low-income rental housing and would have the FHA step in to back $300 billion in refinanced loans for 1 million or more homeowners who otherwise might face foreclosure. The Bush administration opposes the plans, saying it would make the mortgage mess worse. House Democratic leaders regard the Senate proposal as benefitting businesses rather than homeowners. The U.S. Senate passed 88-8 an extension of the renewable-energy production tax credit on April 10th as part of larger Mortgage Foreclosure mitigation bill that was approved too. It was set to expire at the end of this year and is now good through 2009. Extending the tax credits assures that approximately $20 billion in planned renewable energy projects and investments will be made. Homeowners and businesses can offset up to 30 percent of the cost of renewable and efficiency retrofits. The measure now goes to the House where Speaker Pelosi is demanding offsets for the credits. A measure to do so in last year's energy bill failed. "Each electric utility shall make available upon request net metering service to any electric consumer that the electric utility serves." 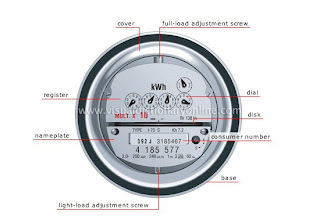 Net metering is a utility electricity use and payment plan that permits customers generating their own power to be compensated monetarily by allowing the customer's meter to actually run backwards if the electricity the customer generates is more than they consume. At the end of the billing period, the customer only pays for their net consumption: the amount of resources consumed, minus the amount of resources generated. AAEA supported the Energy Policy Act of 2005. "Net Metering will help take the edge off the installation cost of Photovoltaic systems. Silicon-based photovoltaic cells (PVs), transform radiation from the sun directly into electricity. Surplus electricity production is reverse metered to the power grid and results in significant reductions in the consumption of traditional fuels. (When and if the rooftop cannot collect enough power for daily use, the rest of the household's power comes from the utility company.) The problem that must be overcome is the two fold cost; first, we need to efficiently fund the solar rooftop power plant and home improvement loans by homeowners are simply too expensive, second we have to reduce the installation cost. We simply cannot succeed one home owner at a time paying retail prices for the material & labor with taxes and compound interest on top of that. We advocate the construction of the rooftop power plant on top of the roofs of our residential infrastructure by big business taking advantage of net metering law in every state. The cost to install one home owner at a time, for the current typical PV installation, is in the range of 18 to 21 cents per kilowatt hour, about twice as much as conventional energy rates. Tax incentives are essential to cutting the initial cost of installation and net metering, which requires electric companies to buy excess power from the solar rooftop, currently offsets installation costs and reduces the pay back time required. When the system produces more energy than the house requires, the meter literally will spin backwards." The problem that must be overcome is the two fold cost; first, we need to efficiently fund the solar rooftop power plant and home improvement loans by homeowners are simply too expensive, second we have to reduce the installation cost. We simply can not succeed one home owner at a time paying retail prices for the material & labor with taxes and compound interest on top of that. We advocate the construction of the rooftop power plant on top of the roofs of our residential infrastructure by big business taking advantage of net metering law in every state. The cost to install one home owner at a time, for the current typical PV installation, is in the range of 18 to 21 cents per kilowatt hour, about twice as much as conventional energy rates. Tax incentives are essential to cutting the initial cost of installation and net metering, which requires electric companies to buy excess power from the solar rooftop, currently offsets installation costs and reduces the pay back time required. When the system produces more energy than the house requires, "The meter literally will spin backwards." So far, 26 states have net metering laws. These laws express the direct will of the body politic. Walker Architects goes on to describe pricing and installation contraints to installing solar panels but concludes that the cost cheaper up front and the price of sunlight will not fluctuate. What we now need is a convenient and effective source of financing to address the highlighted problems cited in the Walker Architects quote. AAEA has developed and is developing mechanisms to help solve these problems. One is Net Metering Backed Securities (NMBS) and another is our Carbon Mercantile Exchange (CMX). Our Carbon Dioxide Reduction (CDR) Program is transportation-based and complements the NMBS concept and the CMX. Solar power provides about one tenth of one percent of America's electricity. That's right: 1/10th of .01. (EIA) We will not go into the many constraints to installing photovoltaic panels on all of our structures; we will just say that photovoltaics should represent a larger percentage of our nation's electricity generation. Solar power is an excellent technology for providing green jobs to inner city youth. This is the exciting aspect solar power brings to the table that is not readily available among the other technologies. There are opportunities in the solar sector from manufacturing to sales to training, installation and remote monitoring. Electricity is such an exciting and practical product that training to become an electrician can provide a lifelong skill. At-risk youth should be targeted for more special programs, such as those included in The Green Jobs Act of 2007. Current renewable-energy tax credits will expire at the end of 2008 if not renewed. Renewal of tax incentives for building and alternative technologies were stripped from the Energy Independence and Security Act of 2007 because they were going to be funded by removing tax credits for oil companies (AAEA did not support this provision). Subsidies do not have to be stripped from oil companies to fund renewal and expansion of energy tax incentives. The Clean Energy Tax Stimulus Act of 2008 (S.2821)extends the investment tax credit for eight more years for businesses. We should add at least $2 billion to this bill in the form of expensing for utilities providing solar power training and jobs via the Clean Renewable Energy Bonds (CREBs) provision in the bill. The bill is cosponsored by Senators Maria Cantwell (D-WA) and John Ensign (R-NV). AAEA will recruit a sponsor for our amendment. The expensing provision should be an amendment to the Section 104 Clean Renewable Energy Bonds provision. Under current law, public power and consumer-owned utilities that cannot benefit from tax credits can issue CREBs to help them reduce the cost of renewable energy investments. Under current law, there is a national CREB limitation of $1.2 billion in bonding authority and CREBs must be issued before December 31, 2008. 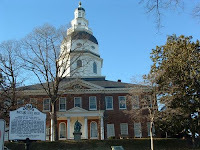 This bill authorizes an additional $400 million of CREBs that may be issued and extends the authority to issue such bonds through December 31, 2009. The bill should be amended to authorize an additional $2 billion and the CREB limitation should be increased to $3.2 billion specifically targeted to expensing green job training and employment. In addition, the bill allocates 1/3 of the additional bonds for qualifying projects of State/local/tribal governments; 1/3 for qualifying projects of public power providers; and 1/3 for qualifying projects of electric cooperatives. There was the Kyoto-Next meeting in Bali, Indonesia in January and this week 1,000 delegates are meeting in Bangkok, Thailand to chat about the successor to the Kyoto Protocol. Unfortunately, greenhouse gas emissions rose 1.1% in the European Union in 2007 under the current agreement. We hope the failure of these Kyoto Protocol signatories to reach their greenhouse gas reduction targets will not prejudice 'cap-and-trade' as a mechanism for reducing global greenhouse gases. The protocol is failing because of faulty design, not inherent flaws in cap-and-trade. States in America similarly botched utilty deregulation by designing a system destined to fail. They deregulated the wholesale market but to a state maintained regulation at the retail level by freezing utility rates. Now those chickens are coming home to roost as utility company are now requesting large rate increases to make up for the freeze years. But we digress. In the 1990's we took green jobs to the water by operating creek walks and boat tours of the Anacostia River, Potomac River and the Chesapeake Bay. We partnered with Seafarer's Yacht Club, America's first Black boat club, to conduct river clean ups during Earth Days. In the 21st Century we have gone international by establishing offices in Nigeria and China. Currently we are promoting a recycling partnership between the richest majority Black county, Prince Georege's County, and Pedreira, Brazil. We hope this Sister City Program agreement will promote green jobs and other types of cooperation between the U.S. and Brazil. AAEA believes green jobs can create needed employment for 'at-risk' youth and veterans. Finally, AAEA worked for the passage of the Energy Independence and Security Act, which included the Green Jobs Act of 2007. This legislation included $125 million to assist with training for 35,000 people. Green jobs will be crucial in mitigating global warming, which is the most important environmental issue facing the world today. "Green Jobs" is the new exciting phrase these days. But is it as exciting as it sounds or just another trendy CETA (Comprehensive Employment and Training Act) Program like the one in the 1970's? Regardless, we doubt that it applies to mainstream environmental organizations. One would think that any so-called 'green jobs' would somehow involve green groups. The environmental movement is a $6 billion per year industry and is one of the most segregated sectors in American society. None of this money is deposited in black-owned banks. The bias against hiring and retaining Blacks represents a clear pattern and practice. The historical discrimination is acknowledged by all and we believe they are secretly proud of their elitism. So it appears that any 'green jobs' will not be forthcoming from green groups. Well what about green jobs from wind, solar and conservation retrofits? Wind and solar combined represent less than one percent of U.S. electricity supply. (EIA) No revolution in job creation there. That leaves some caulking, weatherstripping and storm window installation jobs that are currently available at many heating, ventilation and air conditioning small businesses. We do believe there is a huge potential for job creation in the transportation sector though. Minority entrepreneurs should consider getting into the production and sale of plug-in, fuel cell hybrid electic vehicles. Of course, the government subsidies for green jobs will not help in creating car manufacturing facilities. Hillary Clinton and Barack Obama are promoting green jobs plans. Hillary Clinton and Congresswoman Hilda Solis (D-CA) cosponsored the Green Jobs Act of 2007 (H.R. 2847), which authorizes $125 million annually for greening the nation's workforce by providing job training for 35,000 people every year. That is $3,571 for each training spot. A major appeal of the subsidy is that is it is targeted to veterans and at-risk youth. The Green Jobs Act was part of the Energy Independence and Security Act of 2007 (H.R. 6). Additional government subsidy money will be forthcoming, but it will pale in comparison to the subsidies for big traditional energy. So although we are enthusiastic about the prospect of 'green jobs,' we should also be aware that it will not be a renaissance of employment opportunities for disadvantaged people. Now we have an idea for green jobs, but it is probably too ambitious. It has been exactly one year since the Supreme Court ruled 5-4 that EPA must regulate carbon dioxide. Now some environmental groups, Attorneys General and states intend to take EPA back to court to force the agency to issue an 'Endangerment Determination,' which would formally list carbon dioxide as a pollutant and begin the process of developing rules for managing the greenhouse gas. The petition filed by the coalition today in the U.S. Court of Appeals for the District of Columbia Circuit asks the court to order the agency to publish within 60 days its analysis that found that such emissions endanger humans as well as contribute to climate change. 4) Joe Mendelson, Legal Director, International Center for Technology Assessment (ICTA). The ICTA brought the original petition that lead to this case. James Milkey argued the case before the Supreme Court. The groups believe EPA has willfully chosen to ignore the Supreme Court's instructions. EPA's refusal to act has compelled the plaintiffs to take the agency back to court to force it to comply with the High Court's decision. The one hour discussion today included the implication that if the EPA administrator violates an anticipated court order, he could be jailed for contempt. In another development, today the House Select Committee on Energy Independence and Global Warming, chaired Edward J. Markey (D-Mass. ), voted to subpoena EPA’s documents related to its regulation of tailpipe emissions of heat-trapping gases. According to the Centers for Disease Control and Prevention (CDC) one in four teenage girls has a sexually transmitted disease (STD) and 48 percent of black teenage girls are infected. Most of these girls do not know they have an STD and boys are not even monitored. Abstinence? The U.S. Department of Homeland Security announced today its intent to issue waivers of certain laws to expedite security improvements at the southwest border. 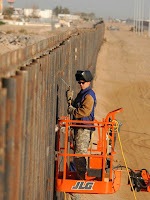 Congress gave the Secretary of Homeland Security authority to waive all legal requirements necessary to expeditiously install additional physical barriers and roads at the border to deter illegal activity. One waiver applies to certain environmental and land management laws for various project areas in Calif., Ariz., N.M., and Texas, encompassing roughly 470 total miles. In addition to environmental and land management laws, this waiver addresses other legal and administrative impediments to completing this project by the end of the calendar year.